For seven years, Lynn Parsons and her big yellow Labrador retriever, Manny, delighted the children by volunteering a half- day each week at Family Relief Nursery. While some of the kids were shy upon first meeting Manny, they soon warmed up to the gentle, furry giant, and looked forward to petting Manny and playing games with him. Our dear friend Lynn passed away summer 2018. We know that Lynn would be very happy that as a memorial, we are going to transform an unused space behind FRN’s SE Portland building into a beautiful garden with a mural of Manny. Manny’s Garden will be a colorful, interactive place for kids to get their hands dirty, learn about plants and pollinators, and enjoy a new outdoor space. Would you like to make a donation over the phone? Do you have questions about the Lynn and Manny Memorial Fund? 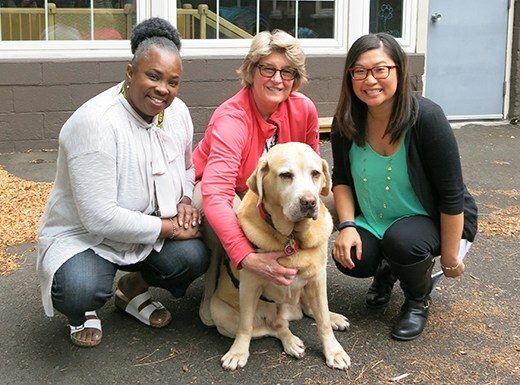 Photo caption: Family Relief Nursery teacher Oletha Roberts, left, Lynn Parsons, and Family Relief Nursery program manager Crystal Ross, take a break with Parson’s therapy assistance dog, Manny.